If my mother was a Spice Girl, she would have been Seventies Spice. 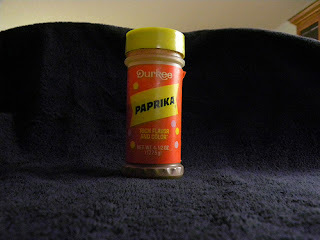 Paprika, the universal spice of the 1970s, was one of the few spices in our cupboard. We also had salt, of course (which was cast over her shoulder when she spilled it), black pepper (which we never used), and cinnamon sugar, which was sprinkled on buttered rye or raisin bread for my breakfast as a child. And garlic salt as well, for meatloaf. I don’t know why paprika was so popular in the 70s. Perhaps because it was reddish brown and the memories I have from that time are tinted in natural, sepia hues of brown, yellow, orange, and pea-soup green. The brown bell-bottom corduroys I wore, the yellow ribbons on the trees to honor the hostages being held in the Iranian embassy, the orange couch I sat on as I played with my little computerized robot 2XL, and the green Jaguar I sat in, in line, waiting endlessly for gas. I wonder if there was cookbook in the 70s called: How to cook chicken and fish. Page one must have read: take a piece of white chicken or a fish fillet. Sprinkle with paprika. Paprika added color, and make it look like you tried. I don’t know why spices have fashions, and for a long time, based on my memories of the plain chicken and fish connected to the paprika, I avoided the spice. Now I love paprika and eat it on sweet potatoes all of the time, along with broccoli, deviled eggs, cauliflower, and Vegan Quorn salad (fake meat mixed with yogurt and chopped vegetables). When in a cheesier phase, I liked it on mushrooms and melted Swiss cheese. Ah, so that explains it. Ironically, around the shelf life of the Spice Girls. I put Paprika on...Deviled Eggs...and Creamed Eggs on Toast that Mom made every Easter (and that I still do). What's with the eggs?? Paprika adds that 'extra something special' to eggs (I even like black pepper). I may have paprika older than you. Hanging head in shame. I still use it on chicken, fish and deviled eggs. It has/had a taste? Who knew??? I've never been fashionable, I guess. I don't use cilantro, although it doesn't taste soapy to me. Now celery seed ... there's a spice. If I were a Spice Girl, I'd be Montreal Steak, since that's my favorite seasoning.